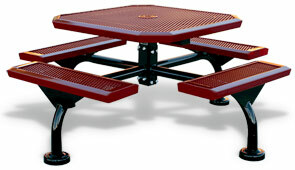 Thermoplastic coated expanded metal forms the top and seats on these Span Style octagon picnic tables. The comfort slope gives the picnic tables a modern look, and also adds extra comfort for sitting and eating. 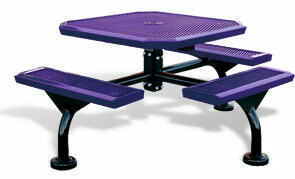 Table top and seats are finished with a lightly textured Polyethylene coating in any of the color options shown below. 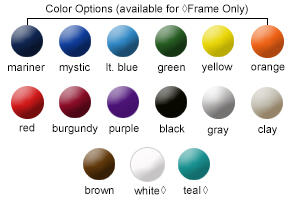 Frames are powder-coated, as are the optional cast aluminum grout covers also available to order. 4,3 & 2 Seat - 46" Octagon Table Top. 3 Seat ADA - 46" x 57" Octagon Table Top. 2 Seat ADA - 46" x 68" Octagon Table Top. 3/4" # 9 Gauge Expanded Metal Top & Seats.